Energy insecurity is India's latest tryst with her post-liberalised destiny. It began in July 2006. Crude oil prices rose to all time peak, at US $79 a barrel. In India, retail prices of petrol and diesel rose, respectively, 59.6 per cent and 78.8 per cent from 2002 levels. A compelled government, and the public oil sector companies, absorbed a staggering 87.5 per cent of the costs of the hike in oil prices. After the price hike last year, many Delhi-ites reportedly switched to buses and the metro--the Delhi Metro Rail Corporation flaunted a 12 per cent increase in trips. As Jaibir Kakar, a retail fuel pump owner in Hemkunt Colony put it, "Our sales do show a difference when the prices rise. The last time prices escalated, our average sales dipped by about 10 per cent. People find ways of saving fuel, whenever the monthly budget gets hit--they use less of it or buy lower-grade cheaper fuel to save money." It is clear that fuel price, in particular the price of transportation, costs each household. Indians are spending more on conveyance than ever before, especially the more affluent in cities, who rely heavily on personal vehicles. According to data collected by the Central Statistical Organisation over the past 10 years, transport accounts for a greater proportion of the household budget in India.In 1993-94, households were spending roughly 56 per cent of their monthly budget on food. By 2003-04, this was down to 45 per cent. During this same period, the single largest increase in expenditure was in transport. In early 1990, the average household spent 11.3 per cent of its monthly budget on transport. By 2003-04, it had gone up to 17.1 per cent. After food, it accounted for the largest part of household budgets. The average household spent more on purchase of personal transport and a lot much more on their running costs--in other words, buying fuel to run vehicles. This same data shows that 8.9 per cent of an average Delhi citizen's monthly expenditure is on conveyance--much higher than the all-India average of 6.52 per cent. In terms of non-food expenditure, this share would increase to 15.22 per cent, much higher than the 11.34 per cent of the non-food expenditure in the rest of the country. Lower income groups in India spend 4-8 per cent of their non-food expenditure on commuting. The urban poor in Delhi, though, shell out about 12-13 per cent. Expenditure on conveyance for the more affluent urban class of Delhi is 15-16 per cent of their non-food expenditure--this is 2-4 per cent greater than the all-India average. Other Indian cities are going the same way. But car sales in the country do not reflect this pinch on the household budget. According to the Society of Automobile Manufacturers (siam), carmakers have never had it so good. Even as the price of fuel shot up, the sale of vehicles boomed, the society points out. Car sales crossed the one million mark in just 11 months of 2006--a growth of 19 per cent over the last year. Sports utility vehicles--fuel guzzling monsters--grew at 7.5 per cent. During the 1990s motor vehicle ownership escalated at roughly 10 per cent each year; about 15 metropolitan cities registered over 15 per cent growth. Delhi, averaging more than 200,000 cars a year, broke its own record--more than 340,000 cars--in 2006. One in ten families in Bangalore now own a car, and almost every family owns a two-wheeler. Just two decades ago, one of every 16 families owned a car and one in four, a two-wheeler. Cheaper loans, rising income, and changing consumer preferences have toppled the global balance the growth rate for vehicles in the West has levelled off at 5 per cent each year; in Asia it is 15-30 per cent per year. But is the Indian economy really capable of absorbing this cost? What are its implications on the country's energy costs? India is importing more and more of the crude oil it needs. The fact also is that more and more of the imported and expensive fuel is being used to drive vehicles-commercial and personal. India's energy security must be understood and deliberated in these terms. By 2006, the country was consuming 120 million tonnes of crude oil, but produced only 34 million tonnes domestically. The problem is that domestic production has more or less stagnated, but consumption is spiralling. Therefore, we import more. Any increase in the international price of crude hits India badly. A staggering share of public money goes into buying crude oil. This cost has its growth compulsion. According to the the Planning Commission's 2006 Integrated Energy Policy, the cost of energy will be one of the country's biggest constraints in India maintaining a gdp growth rate of 8 per cent. The question then is who uses how much fuel. And what can be done about it. According to data of the Union ministry of petroleum and natural gas, India's transport sector is the single biggest user of oil and oil products--roughly 30 per cent of the total consumption. Compare this with the 20 per cent of the total oil usage that goes into cooking energy--including liquid petroleum gas (lpg) and kerosene, which serve millions of poor households across the country. Power generation and industry together account for 30 per cent, which equals the transport sector's oil consumption. The remaining 20 per cent is made up of miscellaneous uses. The much abused farm sector uses only 19 per cent of the total diesel consumed in India for their pump-sets. The transport sector consumes 62 per cent of the total diesel used. Almost all the petrol used in India is in transport. The next bit of the puzzle is in the consumption patterns of petrol and diesel within the transport sector. It is agreed that while most of the petrol consumed is used in personal vehicles, diesel consumption is divided between railways, goods transport, public transport and--increasingly now--personal automobiles. At the same time, it is clear that there has been a massive shift of freight traffic from the railways to roadways. Currently, the railways' share in freight traffic is a mere 26 per cent; roadways hog 74 per cent. This trend can only get worse as new highways are being built, or refurbished, to run parallel to high-density railway routes. India, therefore, is on the route to use more fuel to drive its transportation needs, much like the rest of the world (see box More vehicles). The 2006 Integrated Energy Policy cautions that since there is no economic substitute for the transport sector, energy efficiency of vehicles and use of mass transport must have a high priority in the country. It has estimated that a twin approach--to tighten energy efficiency of all motorised vehicles and movement of freight by railways--would substantially reduce the oil requirements in the coming years. If transport pinches the household budget, the country's budget can hardly remain unaffected. So what can be done. Is efficiency the answer? The answer lies in a hard assessment of our existing fleet. What is the fuel economy of our vehicles? The World Energy Outlook 2006 estimates that the average on-road fuel efficiency for new light duty vehicles is 9.3 litres/100 km in oecd countries and in India it is only slightly worse of at 10 litres/100km. The world is not satisfied and is seriously contemplating-and implementing-policies to improve fuel economy of vehicles. The World Energy Outlook 2006 also projects that if the policies and measures that are being planned by the rich governments are fully implemented, the average on-road fuel efficiency of new light duty vehicles in oecd countries would improve to 6.2 litres/100 km. India is relatively efficient in its fuel use because it is poor two wheelers and small cars still dominate personal transport. But, if policies and measures do not keep up with the changing market, then the country will become more fuel inefficient, not less. As yet, the Indian market has been price-sensitive, keeping car sizes small and affordable, thus creating a substantial customer base for low-cost small cars and two-wheelers (see box Two cheers). Small cars have small engines that use less fuel. And two-wheelers are extremely fuel-efficient compared to cars If the best of small car models have a fuel economy of 18-20 km per litre, four-stroke two-wheelers already give 70-80 km per litre--four times higher. The advantage with two wheelers is greater fuel economy, which is preferred by the Indian customer over performance indicators like power and acceleration. This is driven by the high cost of petrol. Stringent emission standards, too, have "forced" technology improvement. So how efficient are our vehicles? Nobody really knows. The car companies are not required by law to meet a given fuel economy standard. There is no specific certification to assess the fuel economy of different models. Consequently, the data on each vehicle model's fuel economy is not officially available. The Automotive Research Association of India (arai), the official vehicle testing agency based in Pune, collects this information incidentally when it tests vehicle models for certification. It measures carbon dioxide emissions of each model prototype. This measurement helps estimate fuel consumption. This data--so essential for benchmarking technologies and setting standards for fuel economy--is confidential. After much prodding, arai shared some generic certification data with the Right to Clean Air Campaign of the Centre for Science and Environment, New Delhi. But it did not disclose the details of the models tested. This data, howsoever limited, does indicate overall trends in all car segments through successive stages of emissions regulations (see box A mixed bag). A careful analysis of the data shows that overall, Indian vehicles; fuel efficiency has improved over the years. As the emission standards got tightened, fuel economy improved. But this does not reflect the real picture. The share of bigger vehicles is increasing in the country. The bigger the vehicle, the higher its fuel consumption. If this trend continues, then the country will lose the advantage of fuel efficiency offered by small cars. Currently, a large number of car models fall in the fuel economy range of 12-16 km per litre, with engine capacity ranging between 796 cubic centimetres (cc) and 1,400 cc. But this had a lot to do with the fact that the popular 800 cc model of Maruti dominated the market. But there is an increasing trend towards mid-engine capacity. Industry analysts expect this trend to accelerate in the future. Already the combined share in sales of vehicles categorised as compact and mid-size has increased from 53 per cent in 2001-02 to 63.6 per cent in 2004-05. In other words, small cars continue to hog the market in India. But that does not tell the entire story. Within the small car segment, the high-end segment with more powerful engines has begun to dominate. The market share of the Maruti 800 'mini' has fallen from 21 per cent in 2001-02 to 11 per cent in 2004-05. Now, 'compact' cars dominate, which have larger engines. Hyundai's Santro and Maruti's Wagon R are in the range of 1,000-1,200 cc. The Tata Indica's petrol version has a 1,396 cc engine, while the diesel variant has an engine capacity of 1,405 cc. These compact cars together comprise 47 per cent of car sales in 2004-05. There is also a growth of the officially 'bigger'--actually mid-size, luxury and sport utility--vehicle segment. Sales of mid-size cars have increased to 17 per cent by 2004-05, up from 12 per cent in 2001-02. The share of executive, premium and luxury cars is increasing also. The most serious problem, though, has to do with the jumping sales of the worst offenders as far as fuel-efficiency is concerned the hated sports utility vehicles (see graph Are we losing it...). While India takes itself very seriously in the international automobile industry, all market trends of fuel economy show it is moving contrary to the global trend. Internationally, carmakers have improved the fuel economy of their vehicles in response to standards and targets set by regulators. In India, that push is clearly not there. And the portents are not too promising either. Though direct comparisons with the global best are not possible, putting the best of the two worlds together provides the missing pieces in the puzzle of the fuel guzzle. Our 'best' vehicles are notch below the global best as far as fuel economy is concerned (see box Unfair comparison? The best in Europe and the best in India). The difference is partly due to the variation in the generational difference in vehicle models. But it also shows that technologies are available for improving fuel economy. What makes the picture more intriguing is that the carmakers operating in the Indian market are the same that are making more efficient cars in other parts of the world. Is it that fuel economy just doesn't matter in India? We know that is not the truth. The answer without a doubt is that the companies have never been pushed to produce their best. The weakness is in the Indian regulators. VERY crudely, the less fuel the vehicle consumes, the less it emits. Regulators across the world look at this problem in two ways one, they directly regulate fuel economy; two, they set standards for green house gas (ghg) or co2 emissions to address climate change, which indirectly regulates fuel economy. Countries like Japan, China and the us have set fuel economy standards that aim to get more miles per unit of fuel and reduce co2. The European Union has set targets for co2emissions reduction. California in the us has decided to set standards for greenhouse gas emissions. Energy security concerns during the 1970s spurred the us to begin fuel economy regulations for vehicles.Subsequently, commitments made under the 1997 Kyoto Protocol to reduce ghg emissions to avert climate change, led other industrialised countries to design strategies to improve fuel efficiency. Since then, nine regions have implemented regulations that cover a very high proportion of the global vehicular fleet, markets and manufacturers. Among the developing countries, only China has set fuel economy standards. It is also driven by concerns over its energy security. The Pew Centre, a Washington, dc-based think-tank, hascompared all the different global fuel economy standards. It found that the European Union and Japan have the most stringent standards in the world. The us and Canada are the most lax. What is worth noting for the developing countries is that China has set fuel economy standards tighter than those prevailing in the us, California, Canada, and Australia (see graph The global best and worst ). Experience the world over shows fuel economy regulations need proper crafting. Lax standards or exemptions to bigger vehicles, for instance, encourage gas guzzlers. In the us, suvs meet lower standards than cars. A rise in their numbers has meant a decline in the fuel economy there. The us also fails to regularly update standards that reflect new technologies. Fuel efficiency is not a single step tango. Several trade-offs need to be considered so that increased emissions do not offset gains from efficiency. The use of diesel is one such instance. In India, cheap prices have set off a mad rush for diesel cars. The lack of policy to make diesel cars pay for environmental costs has spurred the boom. The 2006 Union budget is good indication. It made the link between tax cuts and small diesel cars more explicit. While granting tax cuts to the small car segment, the government defined 'small car' as one of length not exceeding 4,000 mm, with an engine capacity not exceeding 1,200 cc for petrol cars and 1,500 cc for diesel cars. The latter, more relaxed, limit allowed in large numbers of mid-segment diesel cars. 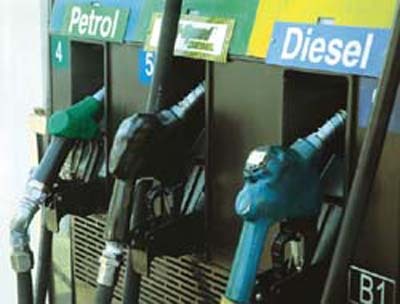 Diesel car prices got slashed by about Rs 12,000 to Rs 25,000. According to information from siam the market share of diesel cars has rocketed over 30 per cent. Other estimates say that it is expected to be as high as 50 per cent by 2010. In Delhi alone, diesel cars have increased by 425 per cent between 1996 and 2006. This increase in the use of diesel vehicles threatens to jeopardise public health seriously. Air quality in Indian cities is at risk and diesel technology, even with the current 'best' Indian technology is highly polluting. A 2004 World Bank supported study assessed and attributed pm2.5--the tiny and deadly particulate that is indicted for health impacts in selected Indian cities--pollution to different sources. This study shows that, depending on the season, diesel contributes as much as 61 per cent of pm2.5 in Kolkata, 23 per cent in Delhi and 25 per cent in Mumbai. Yet another study, conducted by Mario Camarsa of the uk- based Enstrat International Ltd, shows that in Bangalore diesel vehicles contribute as much as 40 per cent of the total nox emissions. Diesel cars are ostensibly more fuel-efficient. And that explains their demand. But these cars are also much more polluting than petrol cars. Japan and California have a two-pronged strategy to deal with the fuel economy and emissions trade-off. On the one hand, they have ordered strict emission standards, forcing carmakers to undertake technology innovations that eliminate both particle mass and numbers by nearly 99 per cent in diesel vehicles. On the other hand, their tough fuel economy standards are compelling vehicle manufacturers to innovate to produce more fuel efficient and clean vehicles. Standards set in California and Japan are now forcing the pace of technological innovation in the world. The aggressive steps at both levels have forced markets in both countries towards a wide variety of technology options, including hybrid electric vehicles. In Japan, there are not just fuel economy standards for cars; it also is the only country to have fuel economy standards for heavy vehicles. The standards are based on different weight-classes of vehicles. This is the only country to have set fuel economy standards for heavy duty vehicles. In each class the fuel economy level of the top runner or best model is the target for the rest in the same class. The current targets broadly imply 23 per cent improvement in petrol vehicles and 14 per cent in diesel cars by 2010 over current levels. Japan's 2009 emission norms for diesel vehicles are one of the toughest. Says Takao Onoda, energy expert at the International Energy Agency in Paris, "If the local pollutant is a problem, it should be dealt with more stringent local pollutant regulation. Japan did so, and now diesel light duty vehicles are a 'dying species' in the country." Likewise, California, has enacted separate ghg standards. These standards, if enforced, would require manufacturers of light duty vehicles to meet fleet wide average targets for greenhouse emissions. These standards will reduce greenhouse gas emissions by 30 per cent in 2016 over current levels. California has also set the toughest fuel neutral standards, equally stringent standards for petrol and diesel cars. This effectively blocks entry of current level of diesel technology. Similarly, China has designed its fuel economy regulations in a way that effectively discourages big diesel vehicles the limit values for the bigger classes are more stringent, and a narrow price differential between diesel and petrol removes the incentive for diesel. It's also tightening emission standards. Absence of fuel economy standards and weak emission norms do not address the fuel economy and emissions dillema in India. Norms currently in force here are Euro III in 11 cities and Euro II elsewhere they allow diesel vehicles to emit more particulate matter and nitrogen oxides (nox) than petrol cars. Even Euro IV standards, currently in force in Europe, allow diesel cars to emit three times more nox than petrol cars. Europe lags behind the global best standards.The us Tier II standards for commercial vehicles, for instance, are approximately 80 per cent tighter than Euro IV norms for comparable vehicles. They are 90 per cent tighter for nox and 60 per cent tighter for pm than even the proposed Euro V limits, which will come into effect in 2008. As far as emission standards are concerned, the us and Japan are ahead of Europe, while India is lagging behind it. Can India learn and act? Policy for fuel efficiency has been slow in India. In 2004, the government's auto-fuel policy asked companies to 'voluntarily' declare their vehicle's fuel economy. But as this was never enforced, companies have shied away from even this. Carmakers do not disclose their fuel economy in their brochures or vehicle specifications. They only announce it in advertisements, to score brownie points over competition. There is no data or certification to back their claim. Instead, they rely on the data from on-road tests by various auto magazines. So consumers are forced to take ill-informed decisions. Now again, some moves are afoot. The draft report of the Working Group on Petroleum and Natural Gas Sector for the 11th five year plan (2007-12) has recommended tough average fuel economy standards to increase vehicle efficiency across the new fleet. It has proposed current fuel economy standards should be averaged for each category and set. Thereafter, they may be increased by 8 per cent per year during the 11th Plan and 5 per cent beyond the end of 11th Plan. The average fuel economy of all new cars, commercial vehicles and two-wheelers would increase by about 45 percent by 2012. But the industry says that fuel efficiency would be difficult to calculate and difficult to maintain given the road conditions. They are worried that consumers will hold them responsible. So, no standards they say. Leave it to the market. But the market is often distorted and does not work 'perfectly'. THIS is the second challenge energy insecurity has thrown up. Strike at the very root. Get rid of excess vehicle miles travelled, control sheer indulgence in personal mobility, or cars. Governments around the world are framing policies to push commuters to use buses, subways, trains, bikes, or even walk to dampen the insatiable need for energy, free up road space from congestion and clean up the air. A policy paper, Transport, Energy, and Global Climate Change available to the German federal ministry for economic cooperation and development shows energy consumption in motorised individual passenger traffic could be up to 10 times higher than a city, which has a well-organised, demand-oriented public transport system. The same holds for greenhouse gas emissions. It cites a recent study of 52 cities, mainly in developed countries, showing a strong correlation between modal split in cities and emissions (see graph Re-public). India could well take this to heart. The International Energy Agency (iea) estimates a 100 per cent difference in oil use and carbon dioxide emissions in a future scenario dominated by travel in high quality bus systems, as opposed to one dominated by private vehicles in Delhi. Even the dirtiest bus, iea weighs in, emits far less co2 per passenger km than other vehicles. The developed world, particularly Europe-despite its obsession with cars-has begun to rebuild its public transport agenda to enhance fuel savings and reduce co2 emissions. In India's key metro cities public transport still meets a large share of commuting demand--88 per cent in Mumbai, 76 per cent in Kolkata, 70 per cent in Chennai, and 62 per cent in Delhi. But fiscal regulators at the Centre and in states have not understood this inherent strength. Tax policies are so distorted that public transport is made to bear a disproportionately high tax burden. A 2004 World Bank estimate shows that the total tax burden per vehicle kilometre is 2.3 times higher for public transport buses than cars in Indian cities. The annual road tax a bus pays in Delhi is higher than the one-time road tax a car pays in any given year. In Pune, the state government has recently pushed in a new passenger tax on public buses, to bail out the state exchequer from fiscal deficit. But the toll to be charged on roads has been dropped because of opposition. For the forthcoming budget, conflicting proposals for the excise taxes on buses have been reported. On the one hand, the ministry of heavy industries and public enterprises has proposed a 16 per cent excise duty on the manufacture of bus and truck bodies, to ensure encoded safety norms for these are adhered to. At present, the bus chassis is charged at 16 per cent excise. If the bus body is fabricated separately there is no excise charged on it. Most agencies prefer to purchase a chassis and get the body fabricated separately, to end up paying the excise tax of 16 per cent and education cess of 2 per cent. This industry wants to bring the fabricators into the tax net. On the other hand, the finance ministry is reportedly also considering exempting buses from taxation. This would definitely boost quality bus transportation. A growing body of evidence testifies to the scale of change that is possible to reduce energy impacts of mobility (see box Take a bus). Other governments have also begun to account for congestion costs while planning fiscal measures, a measure completely ignored in India. The cost of traffic congestion alone represents nearly 3 per cent of gdp in oecd countries and even higher in Asian countries--4.4 per cent in Korea and 6 per cent in Bangkok. Recognition of these costs also compels these governments to find market based solutions to influence commuting choices and offset these costs. Results are impressive. In Singapore, electronic road pricing, introduced in 1988, has reduced traffic in targeted areas by around 13 per cent and increased average traffic speed by up to 20 per cent. This system generates phenomenal revenue per year. Similarly, an area licensing scheme that regulates entry into central business districts has reduced traffic volume by 50 per cent there, despite travel demand tripling over the last 25 years. In London, the central London congestion charging scheme has successfully reduced traffic in the central London charging zone by up to 16 per cent and congestion by up to 30 per cent. In Stockholm a six-month trial of road pricing ended in July 2006, with a referendum, held two months later, on implementing a permanent scheme. Overall, 51 per cent of residents of the Stockholm area voted in favour of a permanent scheme; in Trondheim, Norway, a road pricing system operating between 1991 and 2005 has reduced traffic by up to 10 per cent. Policy interest in mobility management to address energy, congestion and pollution linkages is growing worldwide. In December 2006, the uk government accepted an important study on the long term link between transport and the uk's economic productivity, growth and stability. It advises the uk government to adopt a sophisticated policy mix to meet both economic and environmental goals. The objective should be to get the prices right, especially congestion pricing on the roads, and environmental pricing across all modes. This is the most explicit policy document that highlights economic imperatives of congestion; will government take note? The memory of last year's oil price hike, and its economic and political fallouts, has faded from memory. As India awaits the 2007-08 Union budget, newspapers are abuzz with reports of more tax cuts for cars--this time, bigger cars. The car industry is pushing for this. Are more sops on the anvil? Since 2001, Union budgets reflect a bias towards the car industry, at the cost of serious repercussions on energy and pollution. Massive and successive excise cuts have been allowed. Last year's additional sop for small cars and special allowance for small diesel cars opened the flood gates. Despite enjoying hidden subsidies--not paying the cost of pollution and health damage, the cost of using up urban space for parking and roads and social impacts--the car industry continuously externalises the true costs of its products; government allows it to minimise tax contribution, and so loses revenue. There is no official recognition of the fact that by providing incentives for small cars without setting an effective fuel economy target for different vehicle classes, India cannot avert the great guzzle. The small cars will be less efficient than they should and can be. And without investment in alternative mass transport, their numbers will grow and negate any benefits of fuel economy. The increased status associated with bigger vehicles, with poorer fuel economy and non-existent fuel standards, will only worsen India's energy insecurity. The Union budget cannot and will not be the complete solution. It is the Central government that has to set fuel economy regulations to push the car industry to improve technology significantly. It is the state governments, which have to reduce passenger taxes on buses and increase road and other taxes on personal vehicles. But it is the finance minister who can give the right signals. Tax cars, not buses The minister should craft taxes to support energy efficiency policies for the transport sector as a whole. At the very least, he must maintain a differential between small and big cars. But he must also increase taxation on cars--big and small--and compensate by incentivising public transport system from buses to metros. Buses are part of the solution to the energy, pollution and mobility crises. The forthcoming budget should remove excise taxes on buses and allow its rapid expansion, already planned under the Jawaharlal Nehru Urban Renewal Mission. Carrot and stick The finance minister should do well to design tax in a way that curbing one evil does not encourage another. Take the case of diesel cars. Diesel is supposedly kept at lower prices than petrol because government says that it is needed for the essential economy. This huge differential is pushing a massive shift towards diesel cars and suvs, with serious public health consequences. The options are two-fold. Either the government stops the use of diesel for personal vehicles or it removes the price differential between petrol and diesel in the use of private transportation. It can do so by imposing an additional 'environment' cess on diesel cars, which would effectively nullify the price advantage. To promote diesel vehicles in the name of fuel efficiency, without any obligation to meet fuel economy standards and stringent emissions norms, will work against emission and energy gains. Diesel, being cheaper, also induces more driving, so offsetting both energy and emissions gains--a double loss. cse has estimated the revenue loss on account of diesel usage in cars.Because petrol is taxed heavily, contributing to government revenues, while diesel is relatively less so, each additional diesel car entails a lower revenue for the government. With diesel cars expected to be nearly 50 per cent of the new car sales by 2010, the government will progressively lose revenue from this segment due to the tax difference on diesel and petrol fuels. Diesel car owners recover their 'small' premium for a diesel car within four years because of cheaper fuel. But government shoulders the massive losses--as a subsidy to the rich--in perpetuity. The increase of vehicles running on diesel effectively means that government will subsidise the luxury use of diesel in the country. It is now time, finance minister P Chidambaram, to set new terms; to act; to make a difference.